The port and Samos-city (or Vathí) are at the end of a deep bay. You will be tendered to town, smaller ships however can dock here. Duty free store available. Vathy village Samos : The capital of Samos is called Samos or Vathy (name of the harbor of the capital) and is located on the north-east part of the island, built amphitheatrically around a bay. It has a population of about 9000 inhabitants and is continuing to expand. Old Venetian and neoclassic buildings blend with the new ones, forming an attractive scenery. Samos town is a lively place, full of touristy facilities, accommodations, bars and night clubs The port of Vathy is one of the three main ports of the island. Many interesting things can be seen in the capital of Samos such as the church of Agios Spyridon, the Byzantine Museum and the exceptional Archaeological Museum. Samos town is best explored on foot. When leaving the cruise terminal turn right and after about 200 meter you will find an attractive square fill od sidewalk cafes an surrounding shopping streets. Be aware that most shops close after 2 PM for the siesta. There are many beautiful beaches. The Vathi bus terminal (tel. 22730 27262) is a block inland from the south end of the port on Kanari. The bus makes the 20-minute trip between Vathi and Pithagorio frequently. Buses also travel to Kokkari, the inland village of Mitilini, Pirgos, Marathokambos, Votsalakia beach, and Karlovassi. Schedules are posted in English at the bus terminal. 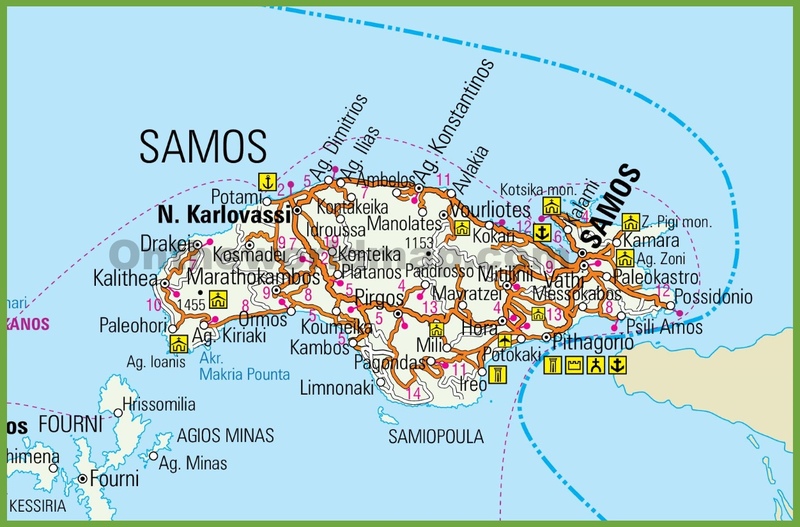 Samos was home to the mathematician Pythagoras, the philosopher Epicurus and the astronomer Aristarchus, , the first to believe the earth revolved around the sun. The Pythagoreion, named after Pythagoras is an ancient fortified port in Samos. A nice and tranquil city with charter and yacht tourism as its main industry today. It has three ports with a new marina and a dock for ferries and passenger boats to other islands like Pathmos and to mainland Greece and Turkey. It contains ancient Greek and Roman monuments and a famous ancient tunnel, the Tunnel of Eupalinos or Eupalinian aqueduct. Along with the Heraion of Samos, the Pythagoreion was registered as a UNESCO World Heritage Site in 1992. Samos has an impressive variety of goods to offer shoppers, from top designer labels and exquisite jewelry to fine antiques and high quality leather goods. Shops are open Monday, Wednesday and Saturday 9 am-3 pm and on Tuesday and Thursday 9 am-8 pm. Tourist shops are open 9 am-10 pm. 7 days the week. Thing to buy from Samos are Wine, Ouzo, Woven goods, and Folk art. Many islanders speak decent English.